Li Jiayun (72) was the top Chinese mainland player, four shots off the pace in equal seventh with Thailand’s Renuka Suksukont (72) and Malaysian Ainil Bakar (73). Chatprapa Siriprakob in action during the second round of the PTT Thailand LPGA Masters in Bangkok on September 14, 2017. 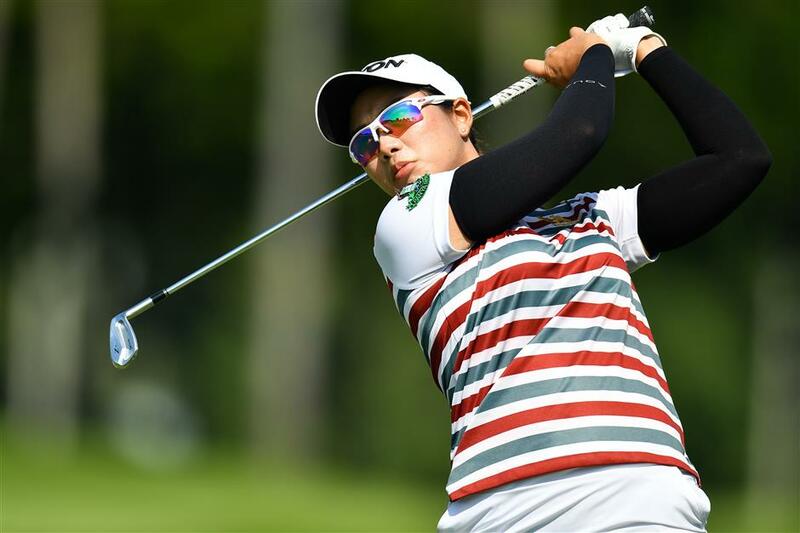 Chatprapa Siriprakob opened up a two-shot lead during second-round play of the PTT Thailand LPGA Masters on Thursday as the Thai veteran carded a 4-under-par 68 in the calm of her early-morning round. With rain and thunderstorms threatening play at Panya Indra Golf Club, north of Bangkok, the Nakhon Ratchasima native was on 6-under 138 through 36 holes. Overnight leader Saranporn Langkulgasettrin stumbled to an even-par 72 to sit equal second with fellow Thai Ploychompoo Wirairungruen (68) and Chinese-Taipei’s Chen Yu-ju (71). Thais Parinda Phokan (71) and PK Kongkraphan (71) were joint fifth, three shots back at the tri-sanctioned tournament between the China LPGA, Australian LPG and Thai LPGA. The 26-year-old Chatprapa made the most of her early start from the back nine when she got to 6 under in a round that featured five birdies against a lone bogey five at the 400-yard 14th hole. Saranporn appeared set to maintain her lead going into the clubhouse after the teenager made a birdie three at the 332-yard 16th hole to get to 7 under. However, disaster struck at the 500-yard 17th hole when she made a double-bogey seven before closing with a bogey five at the last. “It was great on the first 16 holes, except the last two holes. I just lay up from the wrong side on hole 17. My shoulder is supposed to be more right than that, I hit it too left. The grass there is not really good then I missed it so I hit it into the water and two putts for double,” said the Phuket teenager who has won five times in the region this year. After finishing second in her last two tournaments in Chinese Taipei, Chen said she was excited to be in contention and would also be going for it playing from the final group tomorrow. Her round included three birdies and two bogeys. “It's amazing to play with so many excellent players who are playing on the US LPGA Tour. I will learn a lot from them,” she said.